From new and increased service capabilities to a booming market, here is what is making news in the world of OEM telematics. Telematics Service Extension: John Deere is extending the base subscription for its JDLink Ultimate service for select articulated dump trucks, crawler dozers, excavators and wheel loaders. 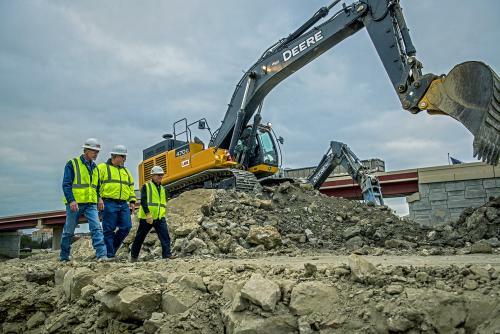 The telematics service, which allows owners and managers to remotely connect to their equipment and receive machine information like location, utilization, performance and maintenance data will be extended from three to five years. As reported in Equipment World, Jena Holtberg-Benge, Director of John Deere’s WorkSight construction technology solutions group, said the extension came as a response to requests from production-scale customers who work their equipment longer and harder and needed a telematics service to support their work “around the clock”. Rental Growth in Saudi Arabia: The market for rental of construction equipment in Saudi Arabia is expected to grow at a compounded annual growth rate (CAGR) of 12 per cent between 2014 and 2020, says TechSci Research. Growth in rental equipment is being fuelled by both public and private infrastructure development projects and rising price of construction equipment. Globally, the construction equipment market is expected to show a CAGR of 7.7 per cent from 2014 until 2020, says ReporterLinker. Currently valued at 142.1 billion USD, the global construction equipment market is expected to be valued at 221.7 billion USD by 2020. According to the report, South America and Asia-Pacific are witnessing strong demand for heavy construction equipment. Telematics Credit Offer from International Truck: US-based International Truck is now offering a credit to its fleet buyers towards the installation of telematics hardware and two years of data service. One of the first in the industry, the telematics credit is intended to allow customers to leverage its OnCommand Connection vehicle diagnostics system to turn unscheduled downtime into planned maintenance as well as allow its network of dealers to have visibility into vehicle health in order to facilitate maintenance and repairs. 6 Ways IoT can Improve Product Support: According to Manufacturing.net, machine telematics data and the way it is collected is in stark contrast to the manual, paper-based method for product support. Internet of Things (IoT) sensors and mobile field service software will enable manufacturers to analyze and deliver more detailed information to their customers and service departments. How else do you think IoT can improve product support for equipment manufacturers? Loving the efficiencies that are driven through technology. Improved designs, real time tracking, and great service. And good on John Deere upping the game extending their maintenance and service.